More and more stolen children of Timor-Leste are speaking out about their experiences of the East Timor conflict in 1975-1999—and their dreams of reuniting with their families. 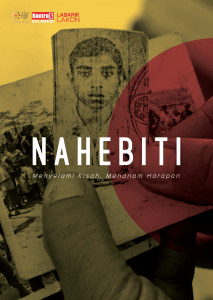 On 16 April 2018, the Labarik Lakon (stolen children) community launched their photobook “Nahebiti” with a discussion on ways to resolve the human rights violations of the past conflict in Timor-Leste, including the separation of Timorese stolen children from their families. This launch was held at the University of Hasanuddin in Makassar, South Sulawesi. Discussion panelists included AJAR’s Indria Fernida, KontraS Sulawesi’s Asyari Mukrim, University of Hasanuddin professor Agussalim Burhanuddin, and Kaoka, a stolen child who spoke about her experiences of being taken from her families in 1978. The photobook and the event made it clear that the Indonesian and Timor-Leste governments have an unfinished business to provide justice for the stolen children of Timor-Leste, including acknowledging their truth, assisting them to reunite with families in Timor-Leste, and guaranteeing that they will never have to experience violence again. “Nahebiti” is published by the Labarik Lakon community, with the support from AJAR and KontraS Sulawesi. Download the PDF here (available in Indonesian).